Choke adjustment procedure and Diagnostics: All 32/32, 32/36, 38/38 series DGV model Webers. Not intended for manually controlled choke models. There are 3 major component elements in the choke system on the DGV series. Bi-metal element that controls heat/time cycles during cold start operation. This article will deal with their interaction and proper setup. 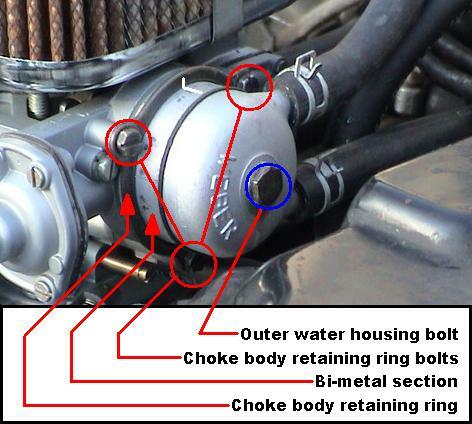 The bi-metal section must be set first regardless of whether the choke has a water or electric add-on section. The bi-metal sets the base choke distance with a predetermined amount of spring tension against the choke butterflies. On almost every situation at cold rest before starting the choke butterflies should be fully closed with some additional tension past closing as applied through the bi-metal section. Keep in mind that the system is mechanically operated. 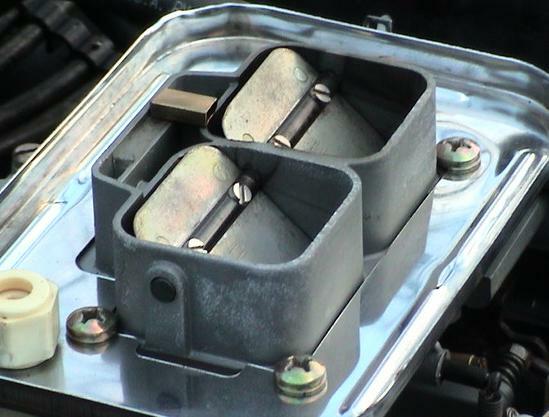 The throttle linkage must be cycled to at least 1/3 throttle to actuate the choke system to close the butterflies. This means that when you start the engine in a cold state (eg. parked outdoors overnight), you must gently press around 1/3 down on the accelerator pedal to set the throttle linkage before starting the engine. To adjust the butterfly position there are 3 straight 7mm bolts located on the side of the choke body retaining ring that allow the bi-metal section to be rotated either clockwise or counterclockwise. Due to build variations there are two versions, each one will turn a different direction to close the butterflies. It can be helpful to make a mark similar to the one on the bi-metal section and the choke body retaining ring (see picture below) to help keep track of the direction of adjustment. During adjustment procedures the throttle linkage must be opened slightly to allow free movement of the choke high idle linkage. Holding the throttle open slightly will allow the butterflies to move freely so you can note what direction to turn the bi-metal element. This initial richness setting should allow the engine to start easily and quickly and continue to run regardless of idle speed. If the engine starts but dies immediately, the choke is not rich enough, if starts but "chugs" then the choke is set too rich. Once the mixture setting of the bi-metal element is set then the high idle speed needs to be adjusted to around 1500 RPMs at cold startup. Tighten the three retaining bolts. Loosen the three retaining ring bolts again to adjust the position of the bi-metal section. Electric add-on elements must be connected to a circuit that is only supplied with power when the engine is running. After a few minutes either the water or electric add-on should get fairly hot, causing the bi-metal heat up which, in turn, causes the choke element butterflies to rotate open. As the engine warms the idle speed will increase. This is normal. Because the high idle system is mechanical, it will not automatically drop the idle speed after the engine is warmed up. It is always a good idea to stay with the vehicle as it warms up. If left unattended, you may return after a short time to find the engine running at very high RPMs.